Okay here is a useful tip to all Fedora lovers like me, there are addict to NVIDIA binary drivers, for there GNOME-Shell to run in a way that they can work with it. Don’t install Fedora 23 yet. When it was released on the 3th of November 2015 it was released with a release candidate of xserver 1.18. The Official announcement of a stable xserver first came Mon Nov 9 13:17:40 PST 2015. This is resulting in NO drivers yet from nVidia I just used an entire day to hack around to understand what was wrong, just to realize, there is no way to make it work with Fedora 23 without downgrading to Fedora 22 there is running xserver 1.17.99.902 . 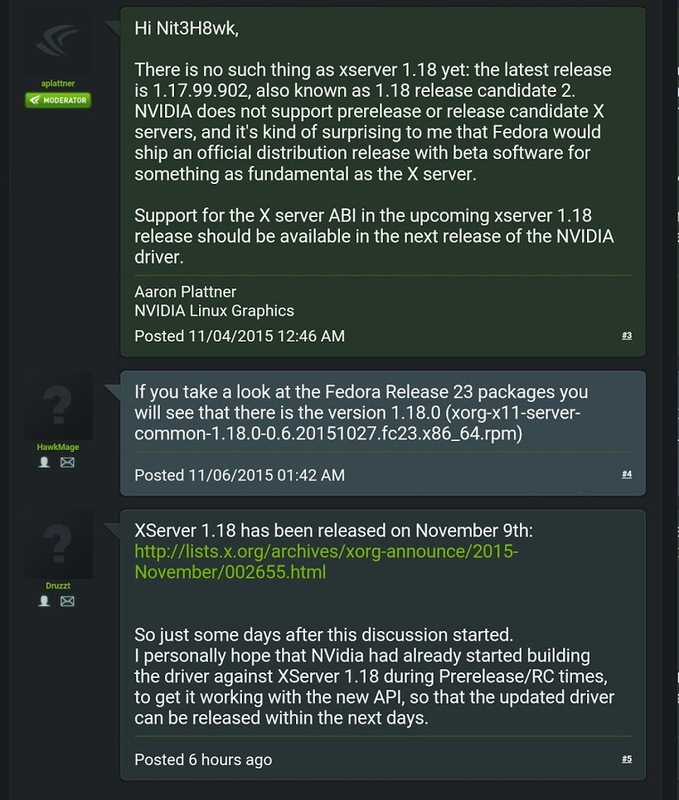 I do have to point out that today is the 13th of November and there is still no driver from nVidia. 4 days nVidia !!!!. Everybody reading this, please make a comment in the nVidia forum.